Anyone interested in learning how to speak during comments at City Council and working in tandem with the BikeSD Advocacy Team please join us for our monthly advocacy trainings. Our Advocacy Team influences decision making, resource allocation, and implementation of bicycle friendly projects and policies. Learn what a speaker slip is and how to complete it. Learn how to time your speaking for speaking at the podium at City Council meetings. Practice making a public comment. Meet other advocates. Make change happen. 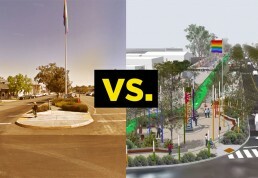 The image at right is a 2016 artist's rendering by KTU+A of a potential configuration of a new Normal Street. It isn't the current design under consideration but merely a sketch. 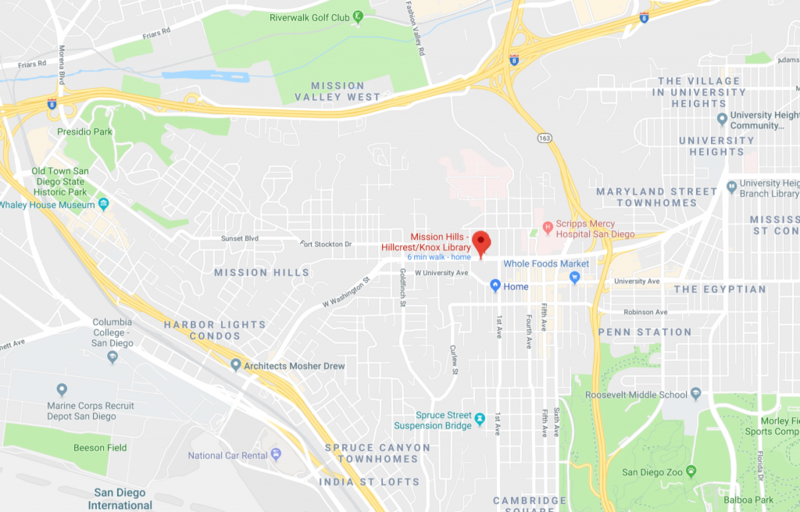 Hillcrest could have a new urban park-like ‘promenade' by the year 2020, if Councilmember Chris Ward’s plan for the Normal Street Promenade meet with success. 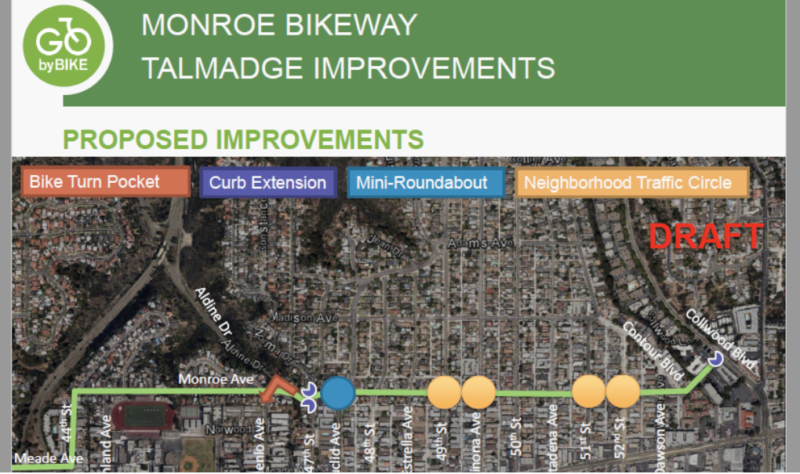 The Normal Street Promendade (2016 sketches shown above) will piggyback onto SANDAG's Eastern Hillcrest Bikeway Project (Phase 2) through this corridor in order to take advantage of the street redesign SANDAG will do for the bike lanes. 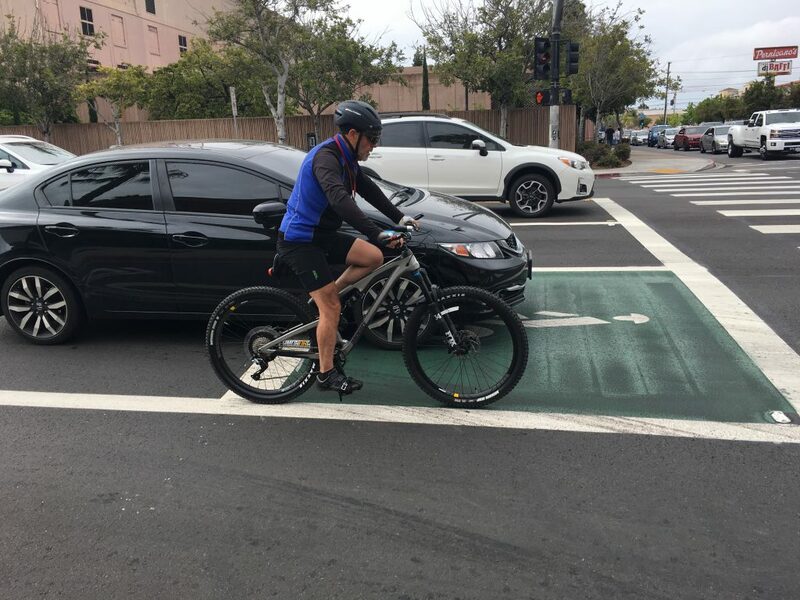 BikeSD has offered qualified support for this new Normal Street pedestrian and biking promenade — but we want all BikeSD members to come to the community meetings where the fate of the Promenade and its SANDAG bikeways will be determined. One concern for Uptown bike advocates is the additional delay to the Eastern Hillcrest Bikeway Phase 2 (EHB) created by allowing time for a new Promenade design. As BikeSD board member Jeff Kucharski (@JeffKucharski_) noted, SANDAG is already pushing back the expected completion date for EHB by 3-6 months to accommodate this new Normal Street Promenade design. Jeff also notes that nominal support from Hillcrest organizations like Hillcrest Business Association can turn into dismantling of bike lanes. “In 2015, HBA publicly advocated for 'Transform Hillcrest' while privately gutting the University Ave bike lanes. 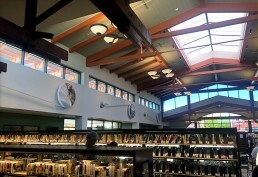 It's easy to see a similar scenario happening here when the Promenade hits headwinds,” he said. It’s critical that BikeSD's biking, scooter, and mobility advocates attend the workshops and Uptown board meeting to make sure the proposed 2-way cycle track and other enhancements remain the centerpiece of the new design. And to press both SANDAG and CM Ward’s office to ensure that the Eastern Hillcrest Bikeways are not excessively delayed in the process of designing this Promenade. 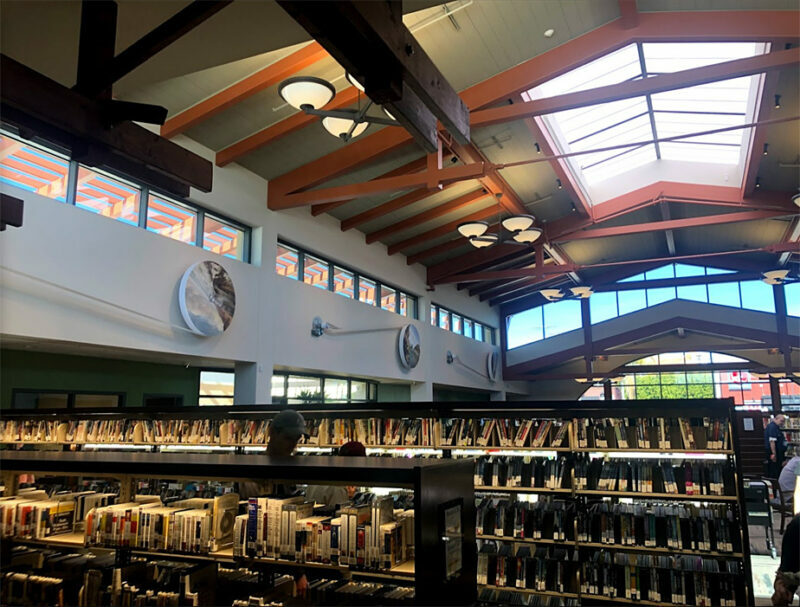 The January 24 and February 19 community workshops also offer an opportunity for BikeSD members to also speak up for mid-speed infrastructure within the Hillcrest community, so we’ll be sending out notices to BikeSD members with details about the workshop next month. 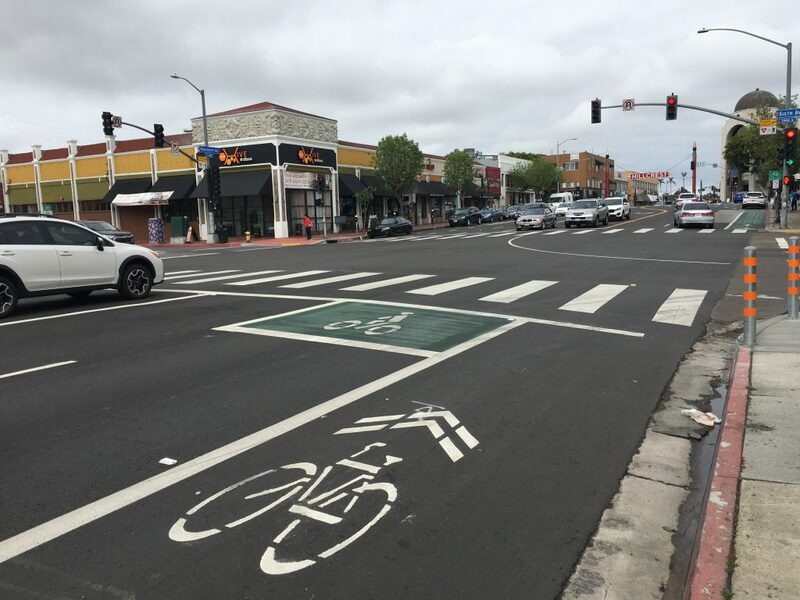 BikeSD had tentative support for this change of striping from staff at UCSD. 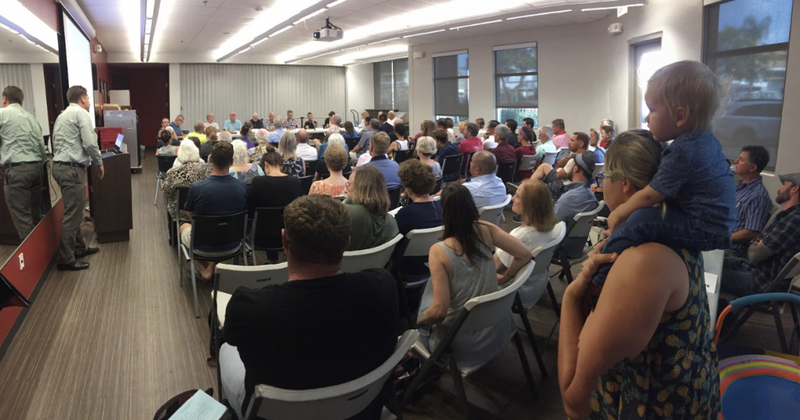 But after BikeSD's executive director presented plans for a road diet to the local community advisory group, UCSD was upset. 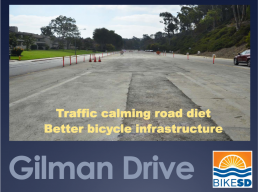 They felt BikeSD had pulled a fast one on them by switching from a “re-striping” to a “road diet.” They weren't sure they could or would support a "road diet" on Gilman Drive. UCSD's reaction isn't surprising to road safety advocates. Very often, when average people — car drivers — hear the phrase "road diet," they have negative reactions. The word "diet" means reducing and restricting. A traditional diet may reduce carbs; a road diet reduces cars. A traditional diet may squeeze down your waistline; a road diet squeezes the room around your car. While notions like reducing cars and squeezing the roadway appeal to bike and safety advocates, these phrases have no positive connotation to people on a community boards, traffic engineers, or average folks who depend on driving. Simply put: when advocates use the phrase "road diet" we conjure up the wrong imagery in the ears of our listeners. On top of that, everyone knows: "Diets don't work." It's time to adopt better phrasing for this important work. I'd like to propose a new framework and term: M.O.S.T. Almost every road diet element is also safety-enhancing step. The problem is that the phrase "road diet" fails to capture any notion of increasing safety. 'Diet' inherently sounds like less rather than more. In reality, we're talking about enhancements, not reductions. MOST is about getting the most out of our road space. MOST street design focuses on maximizing the number of ways people can use a street. Roads which get the MOST design are safer than traditional road layouts. More importantly, a MOST street serves the greatest amount of people -- not just one type of user (typically cars). When we pitch to audiences about bringing the MOST to a street design, we're talking about expanding the road to its greatest, safest capacity. MOST, as a phrase and a framework, reminds everyone (car drivers, walkers, folks, bikers, scooter users, the disabled, parents with strollers...) that we share a common goal: getting the most value from our shared street space. Who wouldn't want the MOST for their roads?